Encounter: Thousands of Spiny Dogfish (Squalus acanthias) accumulate in a specific spot each summer off the west coast of the island. Divers arrive by boat and head down the line to about 30ft. 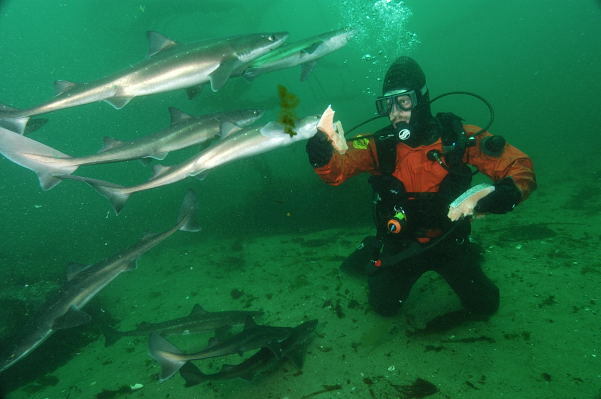 A bag of salmon is introduced which encourages the dogfish to approach the divers. 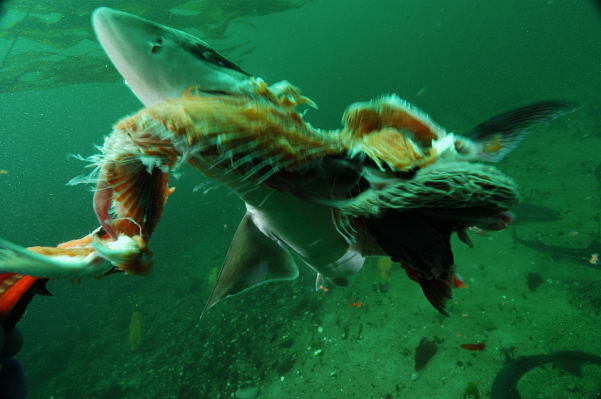 Its then possible to hand feed the sharks. It is not uncommon to be surrounded by hundreds of 2 to 5ft dogfish and have several at once latched onto the bait in your hands. The ensuing tug of war is one of the most entertaining shark interactions that you will ever experience. 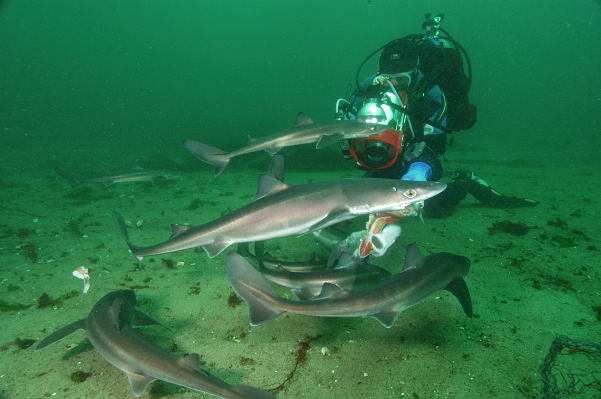 The shark dives are tide dependent as they are in a channel that feeds into Seymour Narrows. Temps are cold all year round so a 7mm exposure suit or drysuit is compulsory. Operators: DynaMike's Dive Charters. Mike Richmond runs weekend charters each summer to the vibrantly colored reefs of Seymour Narrows. Although this is his primary business, the dogfish dive has become so heavily requested that he usually squeezes in at least a couple of dives with the sharks on each trip. His fast aluminum dive boat carries around 12 divers and can get you from the dock to the site in about 15 minutes. Mike is a very knowledgeable diver and the main pioneer of sites around the island. When not underwater he revels in shocking people with his brand of quirky, politically incorrect humor. Abyssal Diving is the second diving lodge on Quadra and its possible that they would also organize a dogfish dive if requested but I have not heard of this occurring. Accommodation: Mike and his wife Darlene operate a dedicated diving lodge (that Mike built out of local timbers) close to the dock. Most divers choose to stay with him and this is part of the package that is offered. Most rooms have four bunks. The lodge caters to small groups and is generally booked months in advance so it is wise to arrange your trip early. Individuals can often join up with dive clubs that tend to book up the prime weekends. Darlene is a fine cook and the lodge is equipped with camera tables, a large diver friendly lounge, a drying room, and an air fill station. There are numerous other B'&'Bs on the island and an alternative dive lodge but Mike's experience is well known and his lodge is a friendly relaxed environment to hang out in between dives. Directions: Quadra Island is located off of the east coast of Vancouver Island, British Columbia, Canada. It is connected to Van. Island via an hourly ferry service from Campbell River. To reach Campbell River drive north from Naniamo, which is in turn connected to the Canadian mainland via a ferry service from Departure Bay north of Vancouver or Twawassen ferry terminal south of Vancouver. Allow lots of time for your journey as BC ferries get very busy during the summer months and its not unusual to have to wait for two or three crossings. The mainland ferries can be booked in advance.